Photo courtesy of Get Inspired Every Day. A sweet, ripe, juicy mango might be the perfect summertime snack, but this tropical fruit can also be used to make everything from cake from curry. Or take this Sweet and Spicy Mango Salad Dressing, it is the perfect way to enjoy the sweet taste of mangos at nearly every meal. The mango pairs perfectly with the kick of heat from the chili. I suggest making a big batch and storing it in the fridge, that way it is available whenever a craving strikes. For a quick summer-inspired lunch, try this Mango Chicken Salad Sandwich. This fun twist on the quintessential lunch favorite is as simple as combining pre-cooked chicken with mango and a quick homemade chicken salad dressing. And don’t you forget the buttery croissant that it gets served on. One bite and you are basically in the tropics. This Summertime Mango Chicken Curry with Coconut Rice is a dish that can be on the table in 30 minutes. It is perfect for those nights when you want to spend the evening out on the patio, not slaving away in the kitchen. It strikes the perfect balance of sweet and savory and is light yet filling – summer food perfected. Finish the slow summer evenings with this Moist Mango Pound Cake recipe. Enjoy a slice as is, or take this cake to the next level by topping it with slices strawberries, a dollop of whipped cream, and a scattering of powdered sugar. Who doesn’t love cool, crisp, and refreshing cucumber on a warm day? Spiced shrimp top marinated cucumber slices in this quick weeknight-friendly recipe for Blackened Shrimp & Crispy Chilled Cucumbers. Start to finish, this dish only takes 30 minutes to prepare. If you are looking for a filling – yet light – dinner, please whip up this Smoked Salmon and Farro Salad Bowl. It might sound intimidating, but farro is a simple rice-like grain that can be cooked in as few as 20 minutes. The smoked salmon can be purchased ready-made at the store so that all that is left to do is assemble the bowls and serve once the farro is done cooking. To really switch things up, add cucumber to this Cool Kiwi Lime Cucumber Refresher. Since cucumber is 95% water, enjoying a tall glass of this kind of tasty juice is a flavorful way to effortlessly up your water intake. If you are watching your carb intake, you can even use cucumber as a stand in for bread. No, it doesn’t taste the same, but these Low Carb Smoked Turkey Cucumber Sandwiches are happy little layers of cream cheese, turkey, and fresh dill. When melons make their debut in the grocery store, you know it’s summertime. Use this sweet and juicy fruit to make effortless Raspberry Melon Breakfast Bowls. 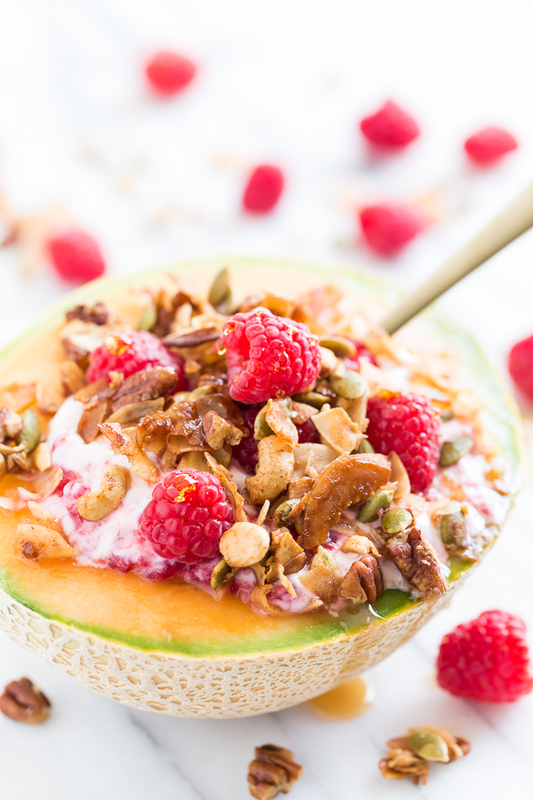 It is as simple as filling a halved and seeded cantaloupe with Greek yogurt, topping it with bright raspberries and crunchy granola, and then drizzling it with honey. No dish washing required. Melon often favors sweet preparations, but also pairs well with salt. This Cantaloupe and Mozzarella Caprese Salad has that wonderful sweet and salty thing going for it. It can also be tosses together in 10 minutes flat. As the summer days get warmer, make these Strawberry Watermelon Popsicles for a refreshing afternoon treat. If you a fan of creamy frozen desserts, this no-churn Melon Ice Cream is sure to hit the spot. Eggplant is most known for iconic Italian dishes like Eggplant Parmesan and Ratatouille. Both dishes cook eggplant in a rich and flavorful tomato sauce and feature hearty Italian flavors like basil, garlic, and melty mozzarella cheese. There’s a reason these dishes have stood the test of time. Eggplant lends itself well to many different flavor combinations, not just Italian. This Baba Ganoush recipe will take your taste buds to the Middle East. Think of Baba Ganoush as a cousin to hummus. Baba Ganoush is a creamy spread that is made from roasted eggplants. The eggplants soften during the cooking process and create the creamiest texture when blended. Use this as a dip for pita and veggies, a sauce for grilled chicken, or as a sandwich spread. If you are looking for a crisp and crunch snack that is still healthy(ish), make these Crispy Baked Eggplant Fries. Eggplant is coated in breadcrumbs and parmesan cheese and then baked to crispy perfection. What’s not to love here? Another healthy swap is using eggplant as the base for mini pizzas. You can sneak in an extra serving of vegetables and still retain most of the pizza flavor. I have discovered that kids will eat pretty much anything if it is pizza flavored, vegetables included. Consider these Eggplant Pizzas your new secret weapon.